Whilst I have written about my garden on this blog once thing is for certain – show garden it ain't. Keen gardeners can admire the splendour and big budgets at the RHS shows at Chelsea, Hampton Court and Tatton Park but in reality our own modest plots are never going to come up to scratch. Thankfully there are a number of dedicated gardeners across the country who not only lovingly tend their gardens to expert standard but are also willing to open them to the public for charity through the National Gardens Scheme (NGS). This year the famous 'Yellow Book' produced by the NGS lists over 3,700 gardens which open to the public in 2013. The money raised through admission tickets, refreshments, plant sales and other other activities goes towards the national nominated charities including Macmillan Cancer Support, Marie Curie Cancer Care, Help the Hospices, Carers Trust, The Queen's Nursing Institute, The Gardeners' Royal Benevolent Fund (Perennial) and The National Trust. Fund raising for local charities is also permitted. So when my friend Christine asked if I could help out running the tombola stall at her garden I jumped at the chance. 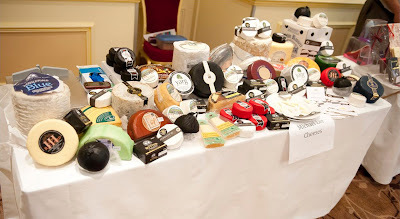 Everybody seemed impressed with the range of prizes we had on offer. All the prizes were homemade and Christine also used a variety of ingredients from the garden for the lavender sugar, rose sugar, elderflower cordial, blackberry and apple jam and rhubarb mini loaves. Over the two days the tombola plus the sales of the seeds donated by Dobies of Devon raised £186. Many of the gardens that open through the NGS do so by themselves. In Barlborough the whole village gets involved over the weekend. The parish church of St. James celebrates its Patronal Festival with a flower festival. Throughout the village are a number of scarecrows made by various local groups plus the Derbyshire tradition of well dressing. For the NGS there is a whopping six gardens that open and all for the bargain price of £5. Each of gardens that open in Barlborough are different. Christine and Vernon at The Hollies took up the challenge of turning an usual suburban layout into a hidden rural haven. A hidden rural enclave and a RHS Chelsea gnome! The plot where their house now stands was once part of the large garden of the house that stands at the front. For most people the long and narrow strip down the driveway would have been simply bricked over but Christine and Vernon have used every space available to them. Ornamental flowers are planted between a number of fruit and vegetable varieties. At the back of the house are beautiful views across the fields. In this limited space the levels have been raised to increase the amount of planting space available. Run out of planting space? You need to start container gardening. Even the smallest garden can fit a few pots in. Herbs and salad leaves are particularly good for this type of gardening and of course provide tasty food. It may seem hard work when it comes to watering but container gardening is great exercise and makes you appreciate the rain even more! 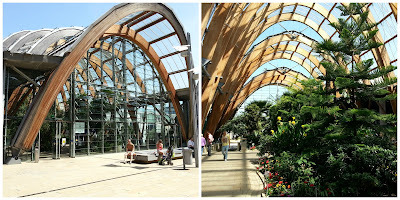 As we were so busy I didn't have much chance to look around the other gardens – the only downside to being a volunteer! However, I was able to sneak a last minute look round Clarendon. My son was quite enchanted by the resident chickens and enjoyed walking over the bridge with the pond underneath. My daughter had a quick game of croquet on the immaculate lawn. All year round interest is provided by the wide range of conifers. Where does the secret path at The Hollies lead to? I arrived home on the Sunday evening with a rather nice feeling of accomplishment. This was compounded when I received an email later that night with the news that an amazing £3,321.30 had been raised for the NGS. If you missed it this year we're already planning for 2014. In the meantime there are plenty of other NGS gardens to find near you. It's not often that there are bananas at JibberJabber Towers which would make themselves fit as one of the ingredients to this recipe as my son is the original monkey boy when it comes to eating them. 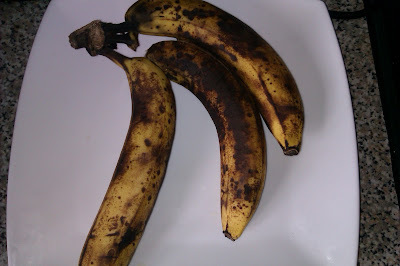 However, a weekend away and I cam back to the horrors of all horrors – blackened and overripe bananas. I say horror as the smell and even the thought of overripe makes me feel all sorts of things which should not be described on a cookery blog. My Nan used to have a Jamaican friend who told her that bananas are best eaten when they have black spots on them. Nan said that as Harry came from where they grew bananas he should know best. My senses remain to this day unconvinced. This recipe is one I have adapted from a Be-Ro book. I made it first last year and found a major fault in it as it asked for the nuts and fruit to be put on top at the start of the baking process. I was a bit unsure when I read the instructions and my instincts were right – the top was completely crozzled. The original recipe called for different sugar, nuts and fruit. I didn't have any of these in stock and since this is designed to use up ingredients that otherwise would be thrown out I didn't go out and buy them but instead substituted with what I had at home. My almonds were whole but I put them in a bag and gave them a whack with a rolling pin to turn them into 'chopped'. As the cake uses maple syrup I am putting this forward for this month's Feel Good Food at Victoria's A Kick At The Pantry Door. Equipment: 1 2lb/900g loaf tin, greased and lined or use loaf liners. 3. In a large bowl mix together the flour and bicarbonate of soda. 4. In a separate bowl cream together the butter and sugar. 5. Add the eggs one at a time and beat them in. Add a little of the flour if required. 6. Add the remaining flour, bananas, almonds and maple syrup. Stir until all the ingredients are well combined. 7. Pour into the prepared tin and cook for 45 minutes. 8. After 45 minutes check the loaf to see if the top is cooking too quickly. Cover with greaseproof paper if it is. 9. Mix together the flaked almonds and sultanas with the 1 tbsp (15ml) of maple syrup. Spoon over the top of the cake. 10. Drizzle over the remaining 1 tsp (5ml) of maple syrup, cover again and cook for a further 15 minutes. 11. Leave for 5-10 minutes in the tin before taking out and leaving to cool completely on a wire rack. It can only be right that England's largest county should have it's own day to celebrate its greatness. In these days where for PR reasons national days are made up on a whim it is quite reassuring to know that Yorkshire Day will be 38 years old this year on the 1st August. Since 1975 the Yorkshire Ridings Society has organized gatherings up and down the county as a reason to show off all that this wonderful about 'God's Own County'. In 1974 the Local Government Act 1972 came into force and with it a complete overhaul of administrative authorities in England and Wales. Many parts of Yorkshire were moved into Lancashire, Greater Manchester, Country Durham and the newly formed Cumbria (formerly Cumberland and Westmorland), Cleveland and Humberside. There was also the creation of South Yorkshire which meant the abolition of the Yorkshire Ridings. The Yorkshire Ridings date back to when Scandinavian invaders came to conquer parts of England. The Vikings called it 'Thrething' while the Danes knew it as 'Thridding'. Both of these mean a third part which is why there was the North, East, and West Ridings but no South. What is known as the City of York today was a county in itself. So disgruntled was the Yorkshire Ridings Society at the changes to their beloved county that they instigated the first Yorkshire Day on 1st August 1975 as a way to keep the traditions and customs of Yorkshire alive. The date of 1st August was chosen as it was on this day in 1759 that the Battle of Minden was won in Prussia in what is now part of Germany. Soldiers from the 51st Regiment, which became the King's Own Yorkshire Light Infantry, picked symbolic white roses from bushes near the battlefields as a tribute to their comrades who had been killed. Year upon year more events have been staged across the county. For the third year running Wentbridge House, near Pontefract, will be running their free event in aid of Yorkshire Air Ambulance and Yorkshire Wildlife Trust. The event runs from 12 noon to 7pm so there will be plenty of time to try one of the fabulous menus that has been developed for Yorkshire Day. Take your pick from lunch, afternoon tea or dinner. In between you'll be spoilt for choice for things to do. 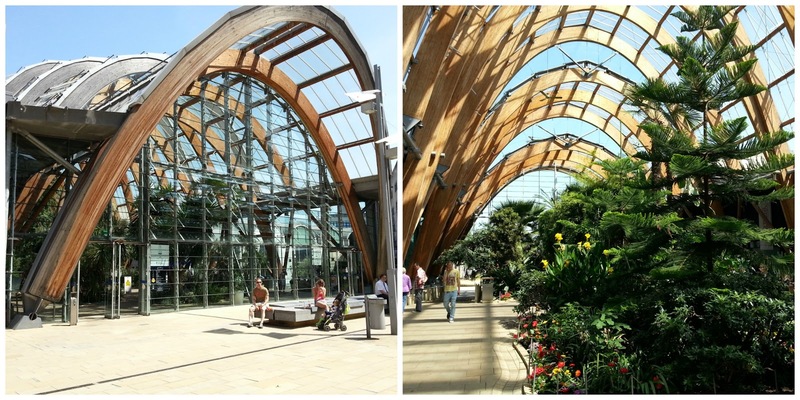 A perfect day out for all the family and a fitting way to celebrate Yorkshire Day! This is a sponsored post on behalf of Wentbridge House. The thoughts, words and photographs are my own. In this extreme hot weather that has overtaken the country it can be quite a task to keep the garden looking good and all the plants alive and well. We have a particular problem as the majority of our fruit and vegetables are grown in containers. In fact some like the radishes are grown in whatever packaging that happens to arrive at JibberJabber Towers! This proves you don't need a large space to start growing your own produce. A few packets of seeds, a suitable container and some compost and you're ready to go. If you are still a bit unsure head over to the Westland site for some expert advice and tips. Despite the sunshine not everything is ready to eat yet. The French beans have raced up the bamboo poles but are only just flowering. The first of the tomatoes have started to develop but are still not ready to eat. One thing that has grown well this year are the courgettes. So much so that some of the pots have had to be banished to outside of the greenhouse. Of course once you have successfully grown all this wonderful produce the problem is what can you make with all of it. I like to grate courgettes and quickly cook them with olive oil and garlic. They also go well as an extra vegetable in a tomato sauce. Alternatively you can try them in a sweet recipe. As ever my solution for any anything is bake it in a cake! I use the fine grater attachment on my food processor to prepare the courgettes. By mixing the yoghurt with bicarbonate of soda and then filling the cases to the top the muffins have a soufflé style top to them. Obviously this does mean they will stink but they still taste great. Equipment: 12 cup muffin tin and paper cases. 1. Put the paper cases into the muffin tin. 3. In a small bowl mix together the Bicarbonate of soda and yoghurt and leave to one side. 4. In a separate bowl stir together the flour, baking powder and sugar. 5. Into the bowl add the courgette, oil, egg, lemon zest, vanilla extract and yoghurt mix. 6. Quickly combine the ingredients until mixed and then spoon into the cases. Fill up to the top. 7. Bake for about 30 minutes until the muffins have puffed up but have cooked through. 8. Leave to cool on a wire rack. This is a sponsored post on behalf of Westland Horticulture. The words, photographs and recipe are my own. I moved to Yorkshire 16 years ago and one thing that has always struck me is the diversity in the people, land and dialects. 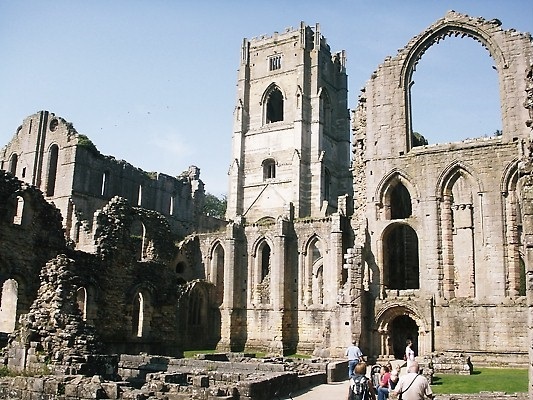 From the southern boundaries with Derbyshire, where I live, up to its northern tip by County Durham you'll find valleys and hills, waterfalls and coast, miles of agricultural land and heavy industry. Often proclaimed by its proud residents as 'God's own County', it seems only fitting that it should have its own day to show off its greatness. Since 1975 Yorkshire Day has been celebrated throughout the county on 1st August. The date was specifically chosen because on 1st August 1759 soldiers from regiments based in Yorkshire placed white roses alongside fallen comrades on the battlefield of Minden in Germany as part of the seven-years war. The Yorkshire Ridings Society decided to hold the first Yorkshire Day as a protest against the re-organization of counties and administrative areas under the Local Governement Act 1972 which came into force in 1974. Over the years the day has changed from campaign to celebration. 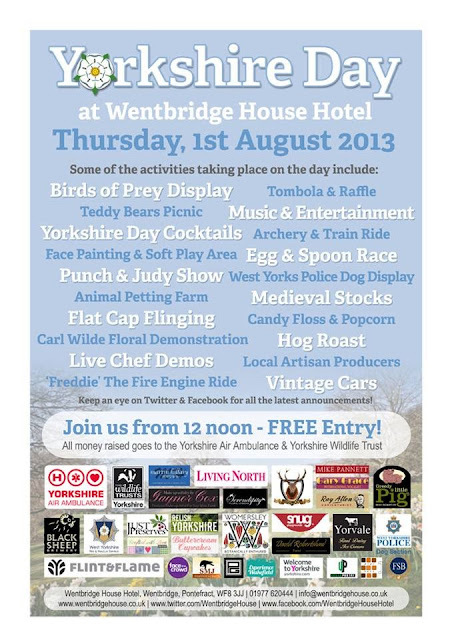 This year Wentbridge House near Pontefract will be hosting their third annual Yorkshire Day on Thursday 1st August. It's free entry for everybody and also free parking. Open from 12 noon there will activities and stalls to keep young and old entertained. For the kids there is face painting, Punch & Judy, Teddy Bears Picnic and an animal petting farm. The local emergency services from West Yorkshire will be coming to show off one of their fire engines and the amazing skills of the Police Dog Display team. One the chosen charities this year is the Yorkshire Air Ambulance, so they'll be on hand to tell you about their important life-saving work. The vintage cars interest all ages and sizes! 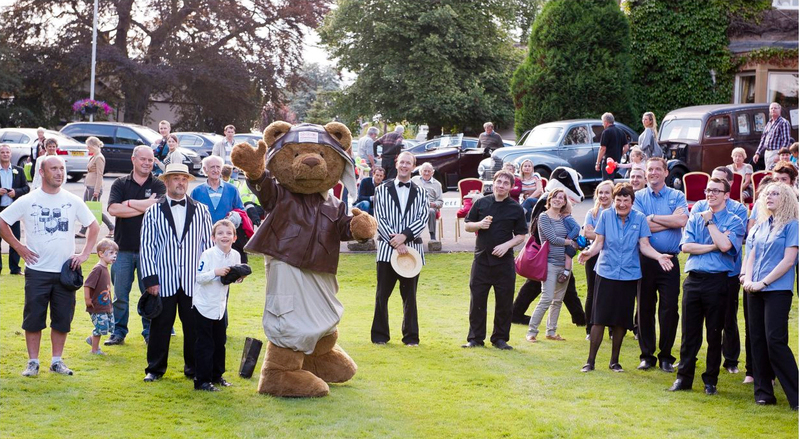 Enjoy some traditional Yorkshire games and see how well you do at welly wangling and flat cap flinging! 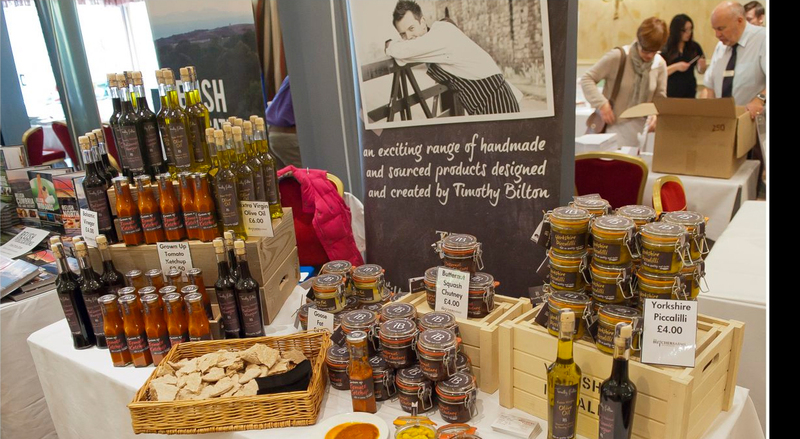 There will also be a chance to try and buy some fine Yorkshire produce with chef demos and wine tastings planned. If you want try some of the delicious meals that Wentbridge House are known for don't forget to book your table for Lunch, Afternoon Tea or Dinner with their specially created Yorkshire Day menus. 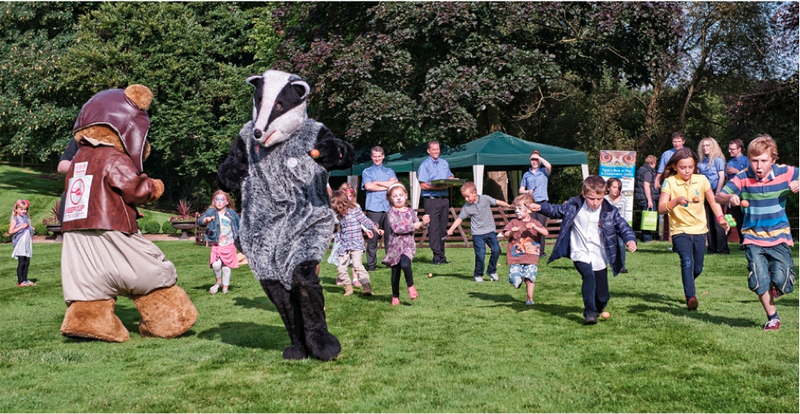 This year's other chosen charity is Yorkshire Wildlife Trust. There will be a chance to appreciate some of the beautiful countryside with a guided walk around Brockdale. For those less energetic grab a seat to watch the birds of prey display. 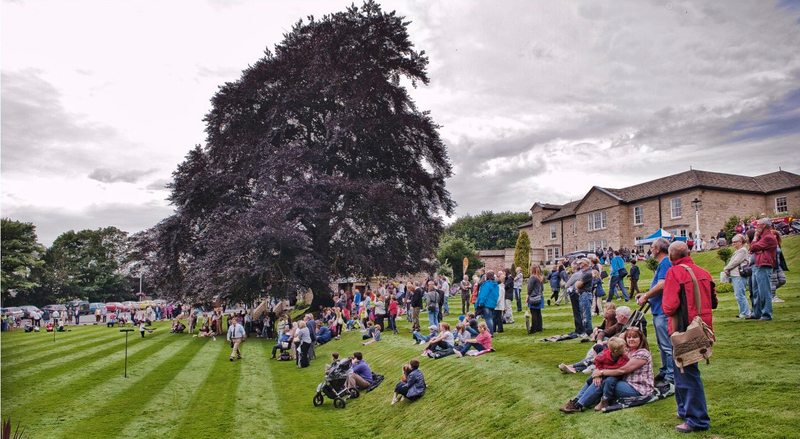 So come and celebrate Yorkshire Day in style at Wentbridge House and remember you don't have to be from Yorkshire to join in! I was asked to write this post to publicise Yorkshire Day at Wentbridge House. As a long-standing Yorkshire resident I was happy to oblige. 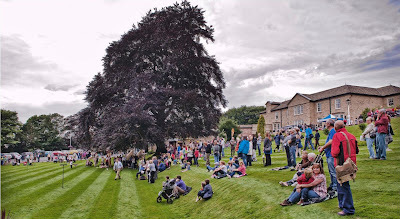 Photographs in this post are used with permission and feature previous Yorkshire Day events held at Wentbridge House. We may be a little old-fashioned at JibberJibber Towers but always on a Sunday we have a roast. Lately, however I have relaxed the insistence on the wearing of ties for the gentlemen and pearls for the ladies. Quite often though it can be hard to get some variety into the roast dinners so it was a welcome relief to be sent some new Schwartz 2in1 Recipe Mixes to try out. 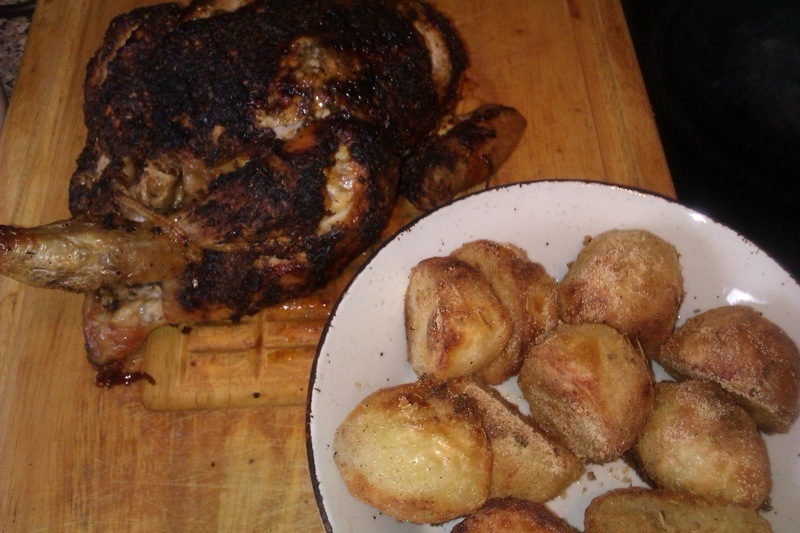 First up was the Garlic and Thyme Roast Chicken + Crispy Roast Potatoes. We usually either put the whole chicken in the oven as it is or sprinkle a stock cube over the top and let the heat do the rest of the hard work. With this mix you need to score the chicken first and then combine the sachet contents with oil and brush it over. To stop the mix getting completely crozzled you need to cover it with foil. While it's cooking you need to prepare the potatoes by cutting to size and par-boiling before placing in a pre-heated roasting dish and then sprinkling over the crispy mix. 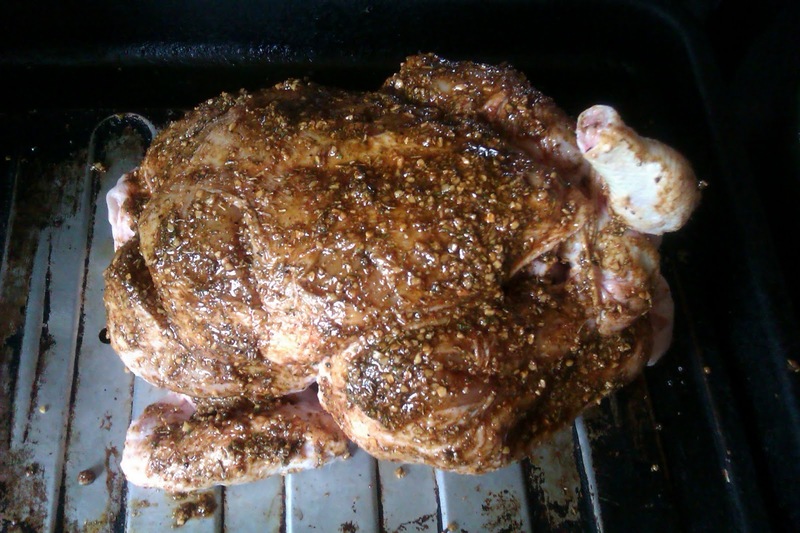 You then take the foil off the chicken and cook both for 45 minutes or until the juices of the chicken run clear. Quite simply really as any roast dinner involves a bit of jigging about with timings and things coming in and out of the oven. The most important thing is of course how did it taste? The chicken was nice and the coating did add an extra element to it but only if you ate the skin which some people avoid (not us). The potatoes were described by my husband as, “Nice...really nice,” and he did say he preferred the potato coating to the chicken one. My son gave his verdict by clearing his plate in record speed. Would I buy it myself? Certainly not as an every week purchase as I consider it something of an extravagance and it didn't blow my taste buds enough to make me fall in love with it. However, if you are having guests round for dinner, got in a panic and wanted a fail-proof way making chicken and potatoes a little different then this is worth a punt. One of the reasons we like a roast on a Sunday is that often there is quite a bit of meat leftover for another meal. On the Monday evening I did the shopping so needed something quick to make. I bought a packet of ready-rolled puff pastry and laid it out on a lined baking tray and folded in the edges. I pricked it all over and then cooked it for 10 minutes at 200°C. Once it was out I stabbed it a couple of times with a fork as it puffs up a bit. Spread it with a 200g tub of crème fraîche and then cover it with the leftover chicken. 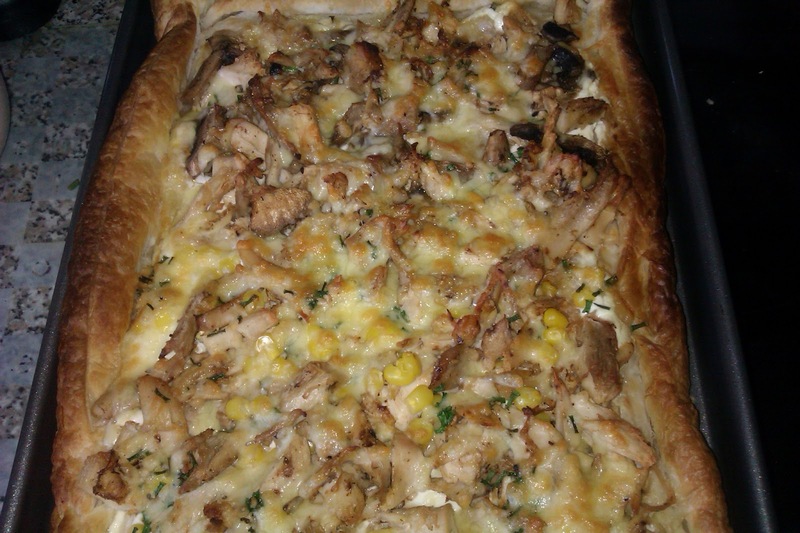 On one half I added mushrooms that needed using up and the other half had frozen sweetcorn (all tastes catered for). A handful of grated cheese and snipped chives from the garden finishes off the topping. Cook for another 10 minutes. Slice and eat. So two meals in the week down and it was on to Pasta Tuesday. This is so-called because my Daughter goes swimming on a Tuesday and requires large amounts of carbohydrates to re-fuel. The next mix was rather conveniently Mediterranean Chicken Pasta +Cheesy Crumb Topping. Having chicken again for a third day would have been a bit much and also the recipe calls for chicken breasts which is outside of the JibberJabber budget. Thankfully, the packet suggests you substitute tinned tuna for the chicken and I always keep a stock of them in the cupboard. One thing to remember is that the recipe ingredients calls for 'pasta, cooked and drained' so remember to do this before you start on the rest of the dish. Once this is sorted you mix the packet with water and a tin of chopped tomatoes add the tuna and sweetcorn (says tin but we used frozen) and heat through. All this then goes into a dish and the topping goes on before it is put under the grill. Onto the taste test. I have to admit while it tasted fine it was a bit sloppy for my liking which is down to the water needed for the mix. I usually just use tinned tomatoes and then thicken with tomato purée. It did have a bit of a kick to it and upon inspection of the ingredients list I noticed both paprika and cayenne pepper. My Daughter didn't gobble it up as quickly as she normally does and I did question if she found it too 'spicy' (an universal term covering anything she doesn't like with a bit of heat in.) She said she didn't but I don't think this one was really a winner in our house. 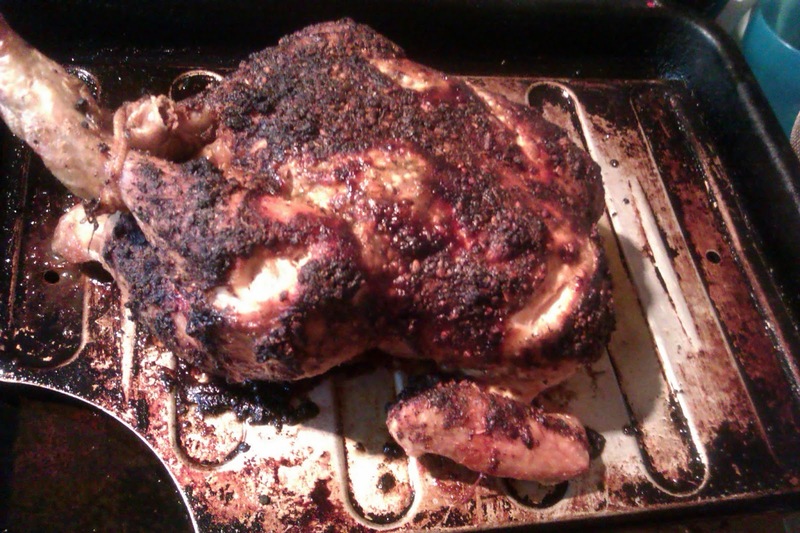 This post is an entry for BritMums ‘What’s for Dinner Tonight?’ sponsored by Schwartz. Find out more about the new 2in1 mixes here. I was sent the above samples to try for free. No payment has been made for writing this post. The views stated are my own and the rest of the squad at JibberJabber Towers (husband and kids).